Those of you who are not BMW aficionados’ need a quick lesson in the Bavarian meaning of the letter M. Almost all BMW model lines are available with an M Sport package. Usually, this consists of sporty upgrades to the looks and handling. While the surcharge is quite hefty for an M Package ( $4,600 in the case of our test vehicle), you receive better value than if you were to order each improvement individually. On our X5, for example, the M Sport group includes a long list of improvements that would cost significantly more than $4,600. Some of the following items are not even available individually: 20 inch M Sport alloy wheels, Sport automatic transmission, High Gloss roof rails, Multi-contour seats, Aluminum hexagon interior trim, Aerodynamic kit, Shadowline exterior trim, and Anthracite headliner. Do not, however, confuse an X5 bedecked with this M Sport group for an X5 M. When the letter M is part of the X5′s official designation, as in “X5 M” you have bought yourself a much more expensive and esoteric vehicle which puts a premium on high performance to the exclusion of any other trait. For example, our test X5, with all-wheel-drive (xDrive) and a 3.0 liter, turbocharged motor (35i) produces 300hp and 295lb.-ft. of torque. Its base price is $55,100. The X5 M on the other hand, which is expected late in the model year, will offer a 4.4 liter turbo V-8 that makes 555hp and 500lb.-ft. of torque. Plan on paying more than $68,200 for this low volume special. There are times when 555hp would be nice, because 300hp is taxed to the max when you need instant acceleration. 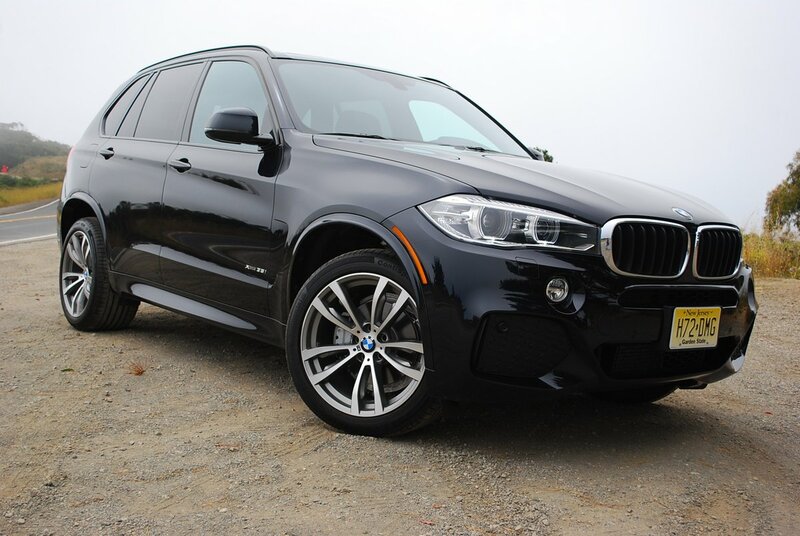 Although BMW put this new 3rd generation X5 on a diet and reduced its footprint by 170 pounds this year, the in-line turbo 6 is hard pressed to provide instant acceleration because the X5 still weighs more than 5,000 pounds. The 8-speed Sport automatic gearbox helps maximize those 300 horses by keeping the engine turning in the fat part of its broad torque curve. From 1,300rpm all the way to 5,000rpm, this motor cranks out peak torque. That kind of pulling power allows you to tow a trailer weighing 6,000lbs. 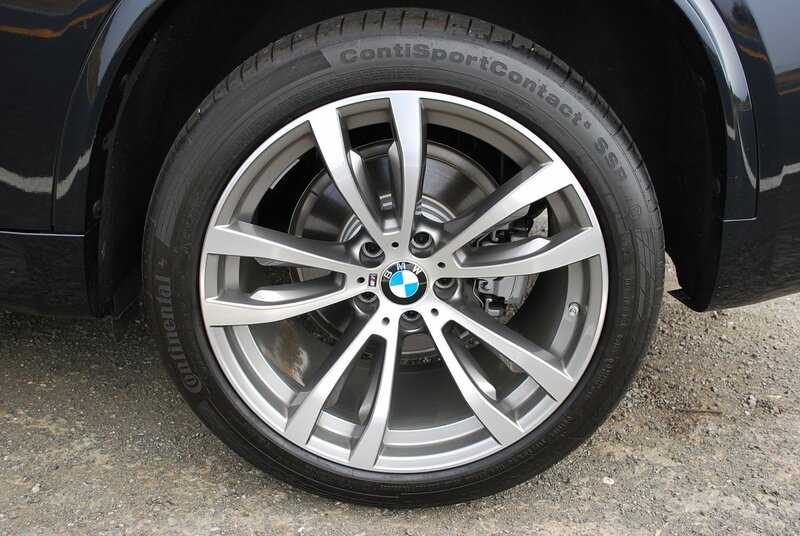 BMW is unusually generous with the wheel and tire dimensions of the M Sport package X5. The 20 inch diameter alloys are 10 inches wide front and 11 inches wide rear. Continental “Extra Load” SportContact tires rival in size the rubber you might find on a Porsche Turbo: 275/40R20 front and 315/35R20 rear. Such a gargantuan footprint insures tremendous stability. It’s virtually impossible to dislodge this X5 from your intended path of travel. Our test X5 enjoyed the added handling benefit of a $3,600 optional Dynamic Handling Package which provides “active” stabilizer bars front and rear that stiffen the chassis platform as you trundle through turns. The package also improves shock absorber response, with a Dynamic Damping system that reduces pitch in turns. Despite the fact that this SUV stands 69.4 inches high, 193.2 inches long, and 86 inches wide, it will handle any twisty piece of pavement you can throw at it with remarkable aplomb. 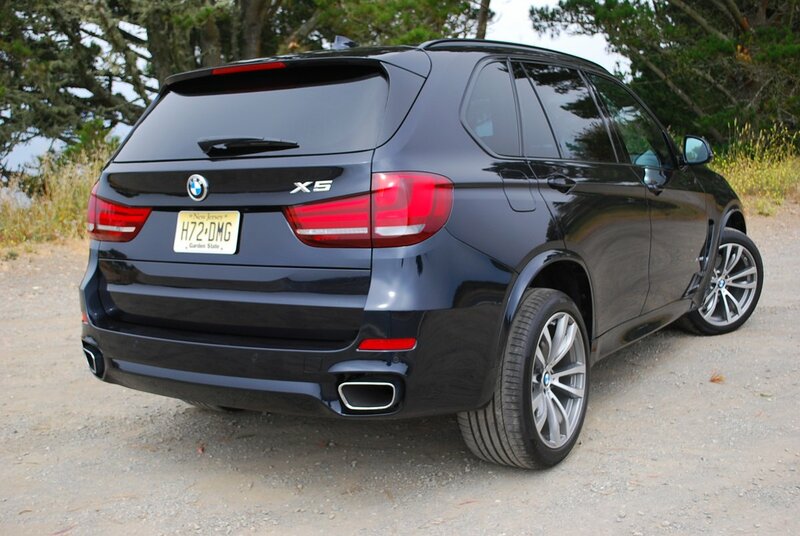 The only drawback to the X5′s size is that it takes both sides of the road and then some to make a U-turn because its turning circle is 41.5 feet wide. Inside, this BMW will seat 4 passengers in exceptional comfort, and 5 in relative comfort. The interior will store 22.4 cubic feet with all seats elevated, and 66 cubic feet with rear seats collapsed. With seats flattened, you will discover many ingenious storage compartments to keep valuables out of sight. For example, the entire rear sub floor can be packed with goods covered by a lid that raises and lowers with assist from an hydraulic strut. The side walls of the rear area also contain small binnacles. Storage pegs fold flush against the walls, as does a wide retainer belt for securing packages. A double railed track system allows use of multiple inserts like a dog shield or specially fitted cargo container. BMW engineers offer you more configurations than a tub of Lego bricks. Finished in a shade of blue that is so dark (Carbon Black Metallic) it looks black most of the time, and done up in black Dakota leather inside ($1,450 extra), the only flash you’ll find in this X5 is the hexagonal aluminum diamond plate that graces the door panels, dash board and center console. And even that injection of bright work is subdued thanks to a matte finish. But if solid virtues of practicality, great handling, and decent gas mileage are more important than bling, this X5 beckons you hither.